This landscape by the co-founder of cubism was painted in a region of France frequented by Cezanne: coastal L'Estaque. 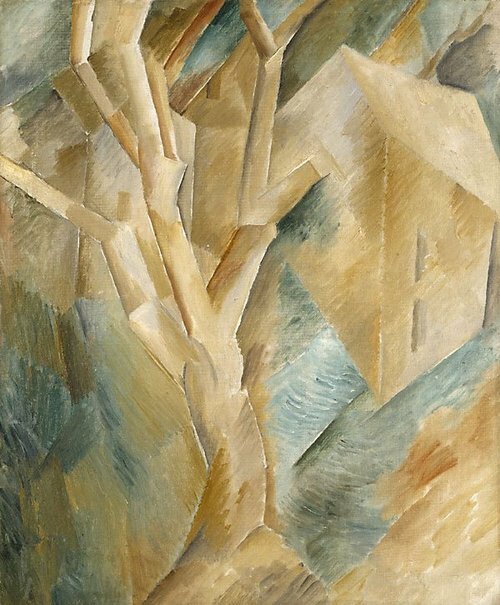 Not unnaturally, Braque's faceted brush-work resembles Cezanne's, while at the same time hinting at the fragmented system of application he was destined to perfect with Picasso. Though it had its genesis in landscape - Braque at La Roche-Guyon, Picasso at La Horta - the cubist method found its purest expression in still life. This painting has elements of that genre, from the object-like character of the houses and tree, to their flattening thrust into the plane of the picture. Braque's shifting of forms in space, indeed his shifting of space itself, announce the fourth dimension of cubism. The landscape is understood almost exclusively in spatial terms, though not without a dramatic connotation specific to the early days of the movement. 'Landscape with houses' has a rawness that would convert to refinement within the year. The palette of browns, greens and unemphatic blues is already, at this date, quintessentially cubist. Signed l.l. verso canvas, black oil "G Braque". Not dated. Perls Galleries, New York, New York/New York/United States of America, stock number 5031. Perls Galleries records are now in collection of the Archives of American Art, Smithsonian Institution, Washington, D.C.
Fine Arts Associates, New York/New York/United States of America, dates unknown, sold to Mrs George Staempfli. Fine Arts Associates business records, now in the collection of the Archives of American Art, Smithsonian Institution, Washington, D.C., contain an undated sales record 'Paintings by Georges Braque sold by Fine Arts Associates, New York' page 3, listing the painting as sold to Mrs George Staempfli. Reel 4051 Otto and Ilse Gerson Papers, 6. Business records, a. Miscellaneous purchase and sales records. George W. and Emily Staempfli, circa 1960-circa 1968, New York/New York/United States of America, by 1960, listed in 'Cubism and Twentieth Century Art' by Robert Rosenblum 1960 as collection of Mr and Mrs George W Staempfli. Lent in 1968 to the exhibition 'Summer loan exhibition including the McIlhenny and Staempfli Collections' at the Philadelphia Museum of Art. Thomas Gibson Fine Art, pre 1977, London/England, Purchased by Galerie Beyeler from Thomas Gibson Fine Art 1977. Galerie Beyeler, 1977-25 Jan 1980, Basel/Switzerland, Purchased by the AGNSW from Galerie Beyeler 1980. Galerie Beyeler stock no. 8814. Renée Free, Art Gallery of New South Wales handbook , 'European', pg. 36-56, Sydney, 1988, 50 (illus. ), 51. Renée Free, AGNSW Collections , 'The Western Heritage, Renaissance to Twentieth Century', pg. 108-172, Sydney, 1994, 145 (colour illus.). Renee Free, Art and Australia , 'European Acquisitions: 1972-83', pg. 63-67, Sydney, Spring 1984, 66, 67 (illus.). Renée Free, Art Gallery of New South Wales collection series 4 , 'Georges Braque 1882-1963. Houses and trees. 1909', pg. 5-8, Sydney, Winter 1983, 5 (illus.). Rodney Milgate, Art and Australia (Vol. 18, No. 2) , 'Artists Choice No. 6: Georges Braque', pg.150-151, Sydney, Summer 1980, 150, 151 (colour illus.). The Post-Impressionists: a retrospective , 'Introduction', pg. 29-34, Connecticut, 1993, 29 (illus.). From caves to canvas: an introduction to western art , 'De-Construct and Re-Construct: Cubism and its followers', pg.216-224, Sydney, 1992, 219 (colour illus.). Portrait of a Gallery , 'European 20th Century Art', pg. 91-95, Sydney, 1984, 91 (colour illus.). Raoul Dufy , New York, 1970, 23 (illus.). fig.no. 19, as 'View of La Roche-Guyon' collection Mr & Mrs George W. Staempfli, N.Y.
Georges Braque, an American tribute , New York, 1964. Picasso and Braque: pioneering cubism , New York, 1989, 112 (colour illus.). Paths to abstraction 1867-1917 , Sydney, 2010, 214 (colour illus.). Psychology: mind, brain & culture , Queensland, 1999, 132 (colour illus.). Art investigator , 'New Visions - Cubism', pg. 182-83, Melbourne, 1998, 182 (colour illus.). From caves to canvas: an introduction to western art (Second edition) , 'De-Construct and Re-Construct: Cubism and its followers', pg.240-250, Sydney, 1998, 243 (colour illus.). Look , 'Close-ups of the Collection', pg. 6, Heidelberg, Feb 1997, 3 (colour illus. ), 6.